Secrets Fly, Pyc First Prize Fany, Little Brown James and Secret Miracle qualify for the Governors Stakes at Indiana Downs Saturday. SHELBYVILLE, IN�SEPTEMBER 22, 2013�Second crop sire NO SECRETS HERE sired the fastest qualifiers to the $50,000-added QHRAI Derby and the $50,000-added Governors Stakes on Saturday afternoon at Indiana Downs. The 10 fastest qualifiers to both stakes, the QHRAI Derby for 3-year-olds and the Governors for 2-year-olds, will return to the Indiana racetrack on October 12 and vie for their share of the winner's purses. Jockey Oscar Delgado rode two-time Futurity winner Secrets Fly to the fastest qualifying time for the Governors Stakes following a half-length win over Pyc First Prize Fany in the second of two trials. He completed the 350 yard course in :17.581 seconds, a 99 speed index. It was the sixth win in eight starts this season for the NO SECRETS HERE colt owned by Cynthia Allen. Bred in Oklahoma by Jovetta Meredith, from the Strawfly Special mare Once Upon A Fly, Secets Fly came into the race off a win in the $180,220 QHIRAI Stallion Service Auction Futurity on August 24. Ron Raper conditions the 2-year-old who also won the Old South Futurity at Delta Downs in May. 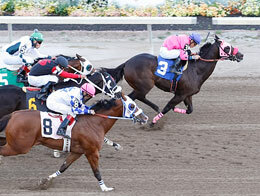 The bay gelding has earned nearly $130,000 this season. Pyc First Prize Fany is a daughter of PYC PAINT YOUR WAGON owned-and-trained by Ricardo Martienz. Alex Baldillez, Jr. rode the filly to the fourth fastest time of :17.663 seconds. Weetona Stanley and W.E. Smith bred Pyc First Prize Fany in Oklahoma from the Mr Jess Perry mare First Prize Fancy. Little Brown James Brown, a gelded son of IVORY JAMES out of Fredas Title by Title Contender, finished third in the second heat to get the fifty qualifying mark of :17.691 seconds. Randy Smith owns and trains the Oklahoma-bred ridden by Cesar Carrillo. Preston and Karen Cloud are the breeder. Also qualifying with the sixth fastest time from that heat was the NO SECRETS HERE filly Secret Miracle. Rolando Almanza trains the 2-year-old, out of Spun With Silk by Dean Miracle, for owner J. Guadalupe Arevalo. Brent and Karl Peterson bred the filly in Utah. Christian Esqueda had the riding assignment. For the complete list of finalists, times, sires, dams, owners, breeders, trainers and jockeys to the Governors Stakes CLICK HERE. Multiple stakes winner Habits Secret defeated Tricky Outlaw by three-quarters in the second of two trails for the QHRAI Derby to post the top qualifying mark of :19.692 seconds, a 109 speed index. Alex Baldillez, Jr. rode the multiple stakes wining son of All American Futurity(G1) winner No Secrets Here for owner/trainer Ricardo Martinez. Vessels Stallion Farm bred the winner of six of 14 starts in California from the Apollo (TB) mare Habitual Dreamer. Winner of the South Florida Derby earlier this season, he has earned $203,140. The top four qualifiers came out of the first trial.